Social and mobile game developer and publisher Game Insight has today announced the launch of Dragon Warlords on Android devices. The 3D online player-vs-player strategy game is set in the same world as Dragon Eternity, and takes place 1,000 years prior to the events of that game. In Dragon Warlords, players journey to the fantasy world of Adan on a quest to not only fight other players online, but also defend their own land from invaders. Dragon Warlords is a base-building combat game, which sees users recruiting an army and protecting their kingdom by balancing the use of key resources, including wood, stone and food. These items are produced automatically over time at a sawmill, quarry and farm, and these individual structures can be upgraded to increase their productivity. Gamers spend resources on those upgrades, but can also spend them on entirely new structures. For instance, unlocking rangers as a military unit requires the construction of the “Archers Barracks,” and so on. Users spend food to recruit troops and enter battle, and can swap out the selection of units they take into battle in relation to the enemies listed alongside each encounter. The game offers both a level-based campaign mode, as well as player-vs-player multiplayer. During combat, players deploy their units on one side of the battlefield, close to their base, with the goal of attacking the enemy base on the other side of the field. Units are spawned using currency, which recharges automatically over time. These troops will automatically walk in the direction of the enemy base, attacking enemies in their path, and eventually attacking the base if and when they reach it. Battles are timed, adding to the difficulty. Players can have a greater impact on battle outside of simply spawning troops, as they have access to spells like meteors and shields that can be cast while playing. Shields protect troops within a circle from taking damage for a limited amount of time, while a fireball attack rains down damage on an opponent, for instance. The meteor / fire spell recharges automatically every few seconds, while spells like the shield or freezing powers (for instance) can be purchased with premium currency. Players receive achievements for completing specific tasks, like upgrading buildings or making sure their defenses are in order. These achievements reward players with premium currency, which is used to speed up the building or upgrade times of structures in the kingdom. Speaking of defenses, users can build guard towers and other defensive structures to defend their kingdom against attacks by other players. These towers can be assigned troops manually so players have just the kind of defenses they’d like to have in place. In addition, when attacking a user with a defensive tower, these items will show up on the battlefield as other enemies for users to eliminate before reaching the enemy base. 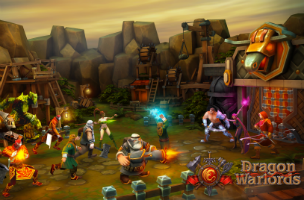 Dragon Warlords is available to download for free on Google Play.